Q. Why should I get a Coppermine custom Theme? A. To make your forum look like the rest of your site. To bring a certain feeling to the viewer that Coppermine may not have as a default. To show your administration should be taken in a serious manner and you are not merely 'passing through' with yet another Forum. To represent a certain tone of professionalism and more. We also have a large number of requests from gaming clans and game host server owners who want a custom theme that matches their clan / battle group colors, etc. Q. How much do you charge for Coppermine custom Theme? A. As cheap as US$50.00 for SMALL EDITS to existing Coppermine Themes. Custom Themes like the Call of Duty cost around $250.00+ or more. If you want added items such as flash effects the cost may go up, however we do not recommend flash for Forums because it can 'choke' the user's browser cache and resources from the constant reload. 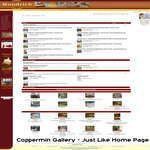 Please use our Coppermine Quote for us to give you an exact quote. Q. How do you accept payment for Coppermine theme jobs? A. If the cost of any job is less than US$300.00 then payment is to be paid in full and in advance of any job to avoid problems for collection later. Jobs significantly over US$300.00 may have a 50% deposit paid at first. This will be agreed upon before work is begun. Payments can be made through CC, PayPal, or Alert Pay. Q. Who owns the theme after you design it? A. The theme is yours and is meant for your personal Forum. If you are requesting a Theme for resale then please inform us as there is a different fee list for that. Also, see below about our Design link. Q. Do you put that you designed it at the bottom of my Coppermine? A. Yes, as a standard. As part of the terms of choosing us to design your custom theme you understand that we will put a discreet "Designed by: BGID" with a link back to here that will hardly be seen on your Coppermine theme. If you do not want us to put that we designed it anywhere on your new Theme then there is an extra fee added to the cost of the overall theme. The fee does not give you the right to resell or redistribute. If you do not want to pay the fee then please keep the "Designed by: BGID" info at the bottom of the theme. In the following examples the clients wanted specific colors or images and an exact look for which we facilitated the same. The idea behind Coppermine Themes we create is to make it exactly as the client wants it to look rather than assume anything. Make sure to read our Coppermine Custom Themes FAQ for prices and terms. Q. Do you do Coppermine Themes for free? A. No, sorry to disappoint but web design is not a hobby or past time for us but it is work and we have a heavy work load. Q. I need some mods (modifications) and codes fixed, is that inclusive of Theme building? A. We can fix codes or add mods for you, but there is a separate fee for that since it is not related to Theme creation. You can always ask us for an estimate. Q. Can you recommend additions to my forum so there are more features? A. Yes, for an extra fee we can install modifications like Blogs, Gallery, Arcade and so forth so that your Forum is a fun place to be! Q. Can you create Themes in other languages? A. Yes, we can handle Spanish or English. We can also translate content into either language. Q. How will you know exactly what I want for my Theme? A. After your initial contact and description we will ask you specific questions to make sure we understand exactly what you want. We may ask you to send the exact images or choose the colors from a color chart. We do not believe in duplicating work, therefore if we know what you want before we start then in the end both parties will be happy. If the client has a specific job list of what they want done then this is even better. We have found both the client and our team have a smooth transition when we can refer to actual job list of specific things that need to be completed, hence we have our Coppermine QUOTE form to take out all the guess work. Q. How long does it take for you to create an Coppermine Theme? A. Usually within a couple of days depending on the degree of difficulty or current work load. Ruler Of Kings 2 Text RPG General Discussion: The Best Text Adventure You Will Ever Play! The official site: RulerOfKings.com By Krusten 6.4 Days Ago Discuss It!